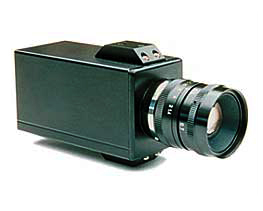 Marshall Electronics Optical Division - Low Light Industrial & Scientific B/W Camera for the automobile, industrial video, covert security, and surveillance markets. Compact size - 1.8"w × 2.1"h × 4"
The V-1070 has all the necessary functions to interface with most computer and imaging equipment used in industrial and scientific applications. This compact solid state camera provides standard RS-170 systems. Its B&W quality picture is the clesest to HDTV on standard video equipment. High resolution 1/2" silicon CCD sensor has 822 (H) pixels × 510 (V), providing 600 lines of resolution. Lens and power supply (V-PS12-1070) not included. Size 1.8" × 2.1" × 4.0"